Firstly, I should note here that I have the best boo. This week: made Downton Abbey themed goods [notebooks and cards] which are now (or will be soon) in the shop, though I need to make more Dowager Countess moleskine notebooks because they SOLD OUT. Bought a Christmas tree, but still haven’t decorated it. Fried foods party. Dinner at Bite. 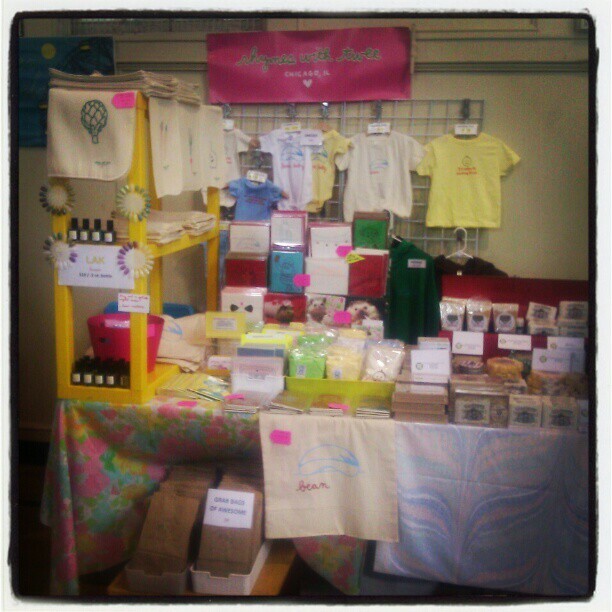 I did my second to last craft fair of 2012 this year: Renegade Craft Fair Chicago Holiday and it was amazing. Jack (Ethically Engineered) is a great boothmate. Had an incredible time hanging out with THE BEST BOOTH NEIGHBORS: Circa Ceramics, Wonder Wheel, and Steff Bomb. Also did some excellent trades for my gift exchange buddy. An A+ excellent fair with super awesome customers. Saturday night I had a sore throat and I thought I had kicked it with cayenne pepper/sea salt gargling, but at the end of the day Sunday, it is back with a vengeance. I have a super busy week at work and then I’m off to my last craft fair of the season, BAZAAR BIZARRE CLEVELAND. FB Event Link. So tired. Must sleep. Think I will be carving a block of Bates as my next Downton character. Have had a few requests for Thomas though, but we’ll see. For now…sleep. Also should mention that there is an article in the Chicago Tribune about the sameness in crafting. I am quoted in it, but it doesn’t note that the girl who copied me said she was “inspired by” my work and then blatantly stole the greeting from my original card and then asked if we could set up a profit share because the card had been so profitable for her, which I declined because it was completely ridiculous. Just wanted to set the record straight! Watched a couple fun movies this week. Makes up for the shite that was The Comedy. I went into it with zero expectations, but left feeling so icky. I do realize that was the point, but why make a movie like that when it is not even enjoyable like American Psycho?